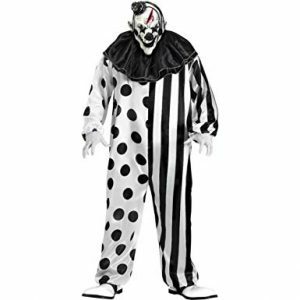 If you are a big fan of clown costumes and you are looking for a model that will make you stand out during Halloween, chances are that you are finding it difficult to select a product that you like. The reason for this is that the online market is filled with countless choices that are way too similar. To lend you a hand, we have prepared a list of options that you might want to check out before making a purchase. Just as its name suggests, this choice is definitely going to terrify your friends. The costume is made of two pieces, a jumpsuit that was manufactured from 100% polyester, and a mask that is 100% latex and that includes hair accents that make it look so much real. Additionally, you will receive a ruffle collar. This sinister model has a black and white design, and it goes together perfectly with a machete or a butcher knife. However, you have to acquire these elements independently. In between uses, it is recommended that you hand wash the outfit. For your convenience, the seller supplies a sizing chart. Another nightmare-inducing model that you should not overlook is the Last Laugh clown set distributed by California Costumes. This alternative is made of polyester, and it measures 3.54″ in height and 7.09″ in width. What is more, those that decide to invest in it will be provided with a collar and gloves, as well as with what the seller calls an ani-motion mask. Although it only comes in one universal size, this unit is said to fit as expected. This purely evil costume is quite realistic and very roomy. Hence, you will surely feel comfortable in it. 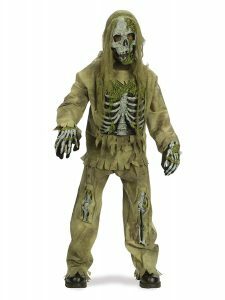 If your kid is a Walking Dead aficionado, this zombie costume might be just what he/she needs. 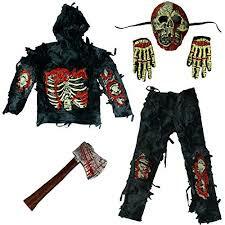 This six-piece model includes a shirt and pants that features attached bones, as well as a hood, gloves, and a toy ax. Because it is made of polyester, this product is considered quite durable. Moreover, the materials used are entirely non-toxic. Consequently, your child will be safe while wearing it. The model comes in four different sizes that you can pick from, from small to extra-large. As a plus, this unit is perfect for dress-up parties and zombie role-playing. So, check it out! 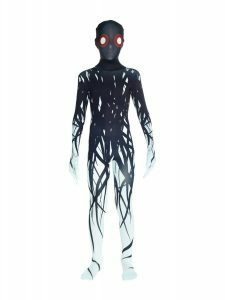 Another product that is suitable to be used by children is this one sold by Morphsuits Zalgo. This option is ideal if your little one intends to get the biggest scares while trick or treating. What makes this alternative so believable is its high-quality printing and the 3D fingers that it features. The material utilized is of high quality, and the design of this choice incorporates reinforced stitching at stress points and sturdy zippers. 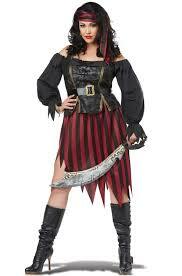 The costume is available in numerous sizes. To select one that best fits you, you have to take into account your child’s age and height. A comprehensive sizing chart is made available by the manufacturer. 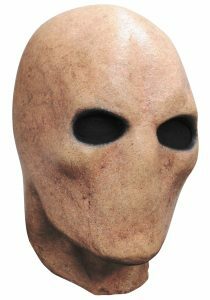 If you are not a big fan of Halloween costumes, but you have nothing against masks, this slender ghost model might cater to your needs. The item is made of latex, which is a reason why it is so comfortable. According to the seller, this molded option can cover the entire face of the user, as well as his/hers top of the head. A slit at the back is also featured for easy access. Before you order it, you should know that the mesh-covered eye openings only allow for limited vision. The choice has received many positive reviews from prior buyers. If you are in the market for funny costumes that were designed to be used by children, check out this one sold by Fun World, as you might like it. This choice was made of polyester, and it comes in various sizes in accordance with one’s age. When shipped, the buyer will also receive a chest piece, a mask, and gloves, all of which are items that can complete the zombie look perfectly. When cleaning it, it is recommended that you hand wash it in cold water separately from other pieces of clothing. This way, you won’t risk damaging it. Owners have noted that this item is budget-friendly and quite cool. All adults interested in a scary looking Halloween costume should also find the time to take a look at the Fun World Pork Grinder. This horrific choice is 1″ high and 14″ wide, and it comes in a single size that can fit people up to 6’/200 lbs. 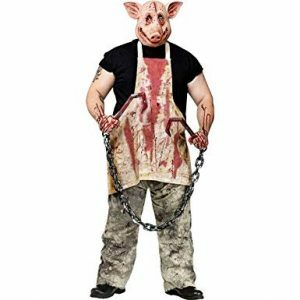 The model includes a pig head mask and a bloody apron that supply the user with that menacing look that he/she has been looking for. However, the meat hooks and the black gloves also displayed in the image of the costume are not included. Buyers pointed out that it is not difficult to see out of the mask or to breathe through it. If you really like the IT movie, or if you just have numerous friends that had terrible nightmares after watching it, this Rubie’s IT Pennywise mask is just what you need this next Halloween. 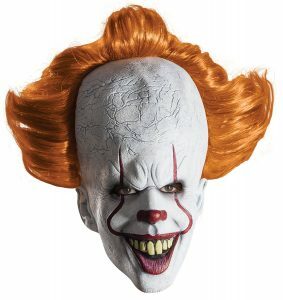 The product was created to fit adults and teenagers, and it consists of the Pennywise overhead mask. The very-popular hair of the clown is also incorporated in the design. This choice is very realistic, and it can also be worn when catching a movie at your local theatre. As users have mentioned, this option looks even scarier in low lighting. Also, the quality of the mask is said to be worth the investment. 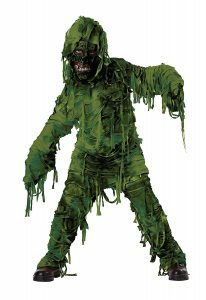 Another alternative distributed by California Costumes is the Swamp Monster child costume. This model comes provided with a textured shirt that features an attached hood, a pair of pants, and a creepy mask. However, the necessary shoes are not included in the price. Also, interested buyers should know that the mask that it features is not attached to the actual costume. The colors of the outfit are vibrant and spooky, and the model is said to fit as expected. Some have remarked that the fabric used in making it is rather thin. Thus, you should dress your child in warm clothing underneath it. This product is entirely made of polyester, and it depicts a clown. What is more, given its design, the model is best to be used by adult females. Because it was designed also to be worn by plus size buyers, the item stretches easily, and it will surely lots of people. Overall, this choice is very well-received by those that have acquired it so far. Yet, just like in the case of other costumes sold by this manufacturer, you should know that the accessories featured in the picture of the product are not included. This product is well-priced and, all in all, a good purchase. 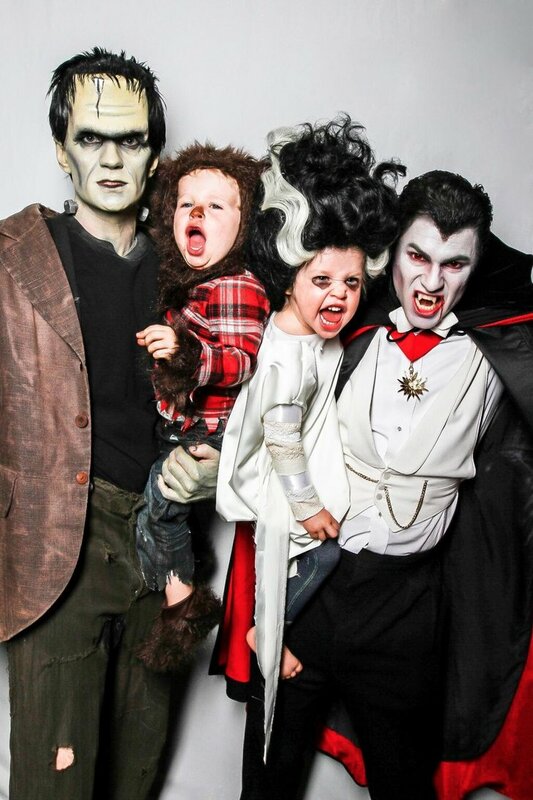 One of the struggles most of us have to face every year has to do with finding the best scary costumes for Halloween. As you already know, this task comes with its ups and downs, as most of us simply don’t know what characters to pick or what costume to choose. What is more, this yearly task is made even more problematic, as the market seems to be overflowing in various products that make this decision even more complicated. 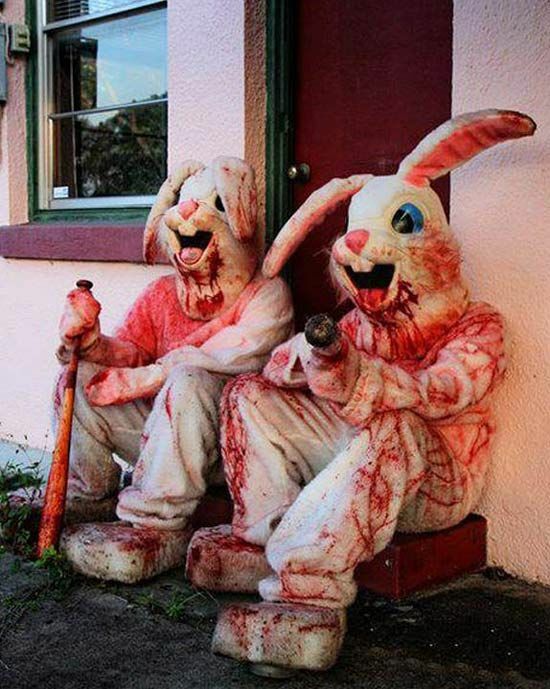 Furthermore, when it comes to finding good scary costumes, you are most probably trying to purchase an original model so that you won’t wear the same thing as one of your friends. Given these already mentioned difficulties, we have decided to lend you a hand. In an attempt to help you out we have decided to compel a short but comprehensive list of features that you should have in mind when shopping in this line of products. So, read ahead and pick accordingly! One of the firsts aspects that you might want to bear in mind before you place any orders is your age or the age of the person that you are shopping for. As you know, some costumes are better suited for children than for teenagers or adults. For instance, if you are in the market for cute children’s Halloween costumes, we recommend that you settle for something inspired by the latest animated movies. Therefore, you could always settle for an Elsa outfit for your little princes or a minion costume for your little boy. Similarly, you can always dress your toddler as a muffin or an ice cream cone. This way, he/she will steal the attention wherever he/she goes treat or tricking! However, if you are interested in awesome scary Halloween costumes that are suitable for teens, we suggest that you pick a maiden pirate outfit, a Batman costume or even a 20’s inspired dress. Still, before you place any orders, it might be a good idea to make sure that the teen that you are buying it for is happy with your pick. Lastly, when it comes to selecting a model that is fitting for an adult, one can always opt for his/her favorite superhero costume. Moreover, one could also dress up as his/her favorite celebrity and/or movie character. Another detail that you should take into account before you make up your mind is the model’s size and the material used in the making of it. In other words, we believe that it is prudent that you take the time to verify whether or it the product that you have chosen is true to size. Furthermore, make sure that the costume is made out of quality, non-see-through fabric (still, this latter feature depends on the product itself). To get a better grip on the product, we advise in favor of you spending some time reading the feedback left by previous buyers. Moreover, make sure that you select a product that has been specially designed to fit your age category. Hence, buying a costume that has been designed to be used by children and giving it to an adult is a major no-no. Likewise, instead of buying a costume that you know that needs altering, we recommend that you make one yourself, from scratch. If you decide to do so, be sure to check out the various DIY tutorials that you can find available online. Last but not least, another trait that you should think about has to do with the model’s originality. 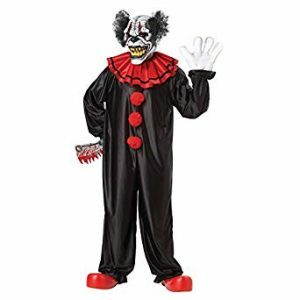 Therefore, if you and your friends want to have the best scary clown costumes so that you will be the center of attention, we believe that rather than purchasing an online product, you should make the costume yourself. What this is is a good idea, especially if you have experimented with making clothes in the past or, better yet, if you have a talented friend that is willing to help you. Besides the outfit itself, you should also consider makeup. Let’s be honest, today, a little bit of makeup can transform a person and make it unrecognizable. Nonetheless, to do so, one needs advanced capabilities when it comes to applying the makeup. Still, if you need some extra help and a dose of inspiration, we suggest that you go online and that you follow the step by step instructions given by proficient makeup gurus. Besides, if you don’t want to invest a lot of money or effort in a costume, you could invariably take the easy way out. For instance, you could personalize an orange t-shirt by putting the Greek letter pi on it. Consequently, you’ll have a witty costume that depicts a pumpkin pie (pi). Similarly, you can just take a plain white t-shirt and a black sharpie and write 404 error, costume not found on it. Furthermore, you could glue inflated balloons on your clothes and transform yourself into a bubble bath. Even more so, you could complete the look by wearing a colorful loofah as a purse and a shower cap instead of a hat. If you need a last minute costume, you could always dress in comfortable clothes and add a fanny pack, a pair of big sunglasses, and a camera to your outfit. This way you’ll become the walking depiction of any tourist out there. If you have completely forgotten about Halloween, but you still want to go to a theme party, we suggest that you settle for the night in costume. To pull this off, just grab an oversized blanket and wrap it around yourself. As a plus, make sure that you carry a bag of chips with you throughout the night. To make the costume even more credible, go around the room and complain to everybody about how you’d rather be home.